This post builds on a recent post called “We all drink downstream”. Over the past decade, a lot of water terms have been introduced to policy debates and popular media: water foot printing, virtual water, and the concepts of blue water, green water, and grey water. These concepts are important because they seriously influence water policy and decisions by companies throughout the world. They have also been discussed widely in the coffee world, and this blog. 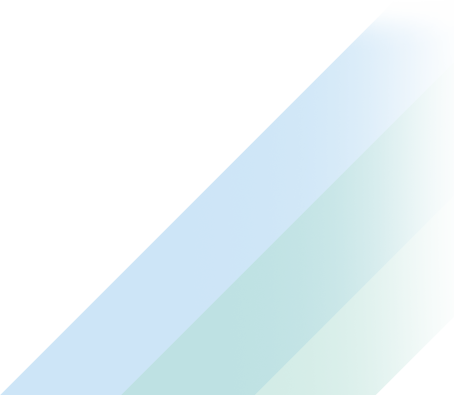 Here, I’m going to focus on the concepts of bluewater and greenwater. 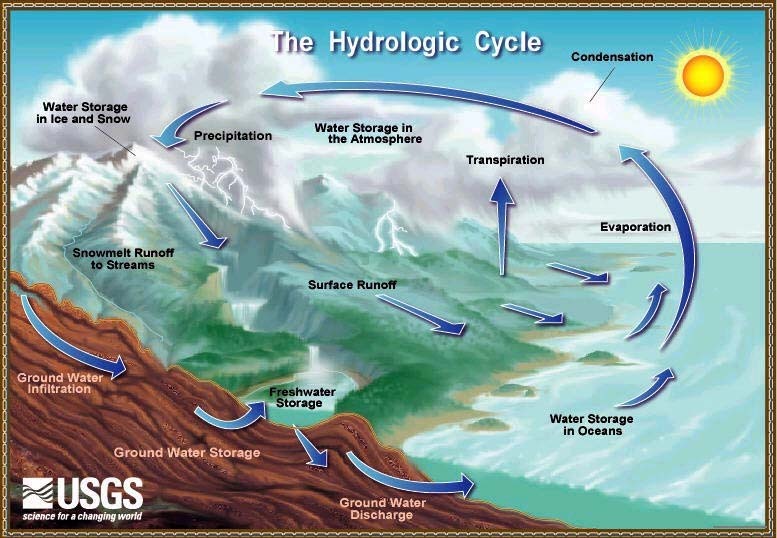 To start, it’s helpful to look at the water cycle (the US Geological Service’s has a very cool version). Being a cycle, there is no real starting point, but convention usually has it starting with water falling from the atmosphere as precipitation (rain, snow, ice, dew or fog). Most precipitation falls over the ocean where it eventually evaporates and returns to the atmosphere; a relatively small amount falls on land. The vast majority of precipitation (around 90%, depending on local conditions) that falls on land stays within a fairly tight cycle we call the Greenwater Cycle. This cycle includes all the water that moves through vegetation (natural vegetation and cultivated crops) and soil. Through a combination of evaporation, transpiration, natural physics, and biochemistry, this greenwater combines with carbon and other elements to produce terrestrial life in all its abundant diversity. Through this process it returns to the atmosphere. Since water makes up about 70% of most vegetative life on the planet, the amount of water moving in this cycle is HUGE. For a spectacular illustration of greenwater in the Amazon, see a 4-minute clip from the BBC’s “invisible flying rivers”. In a sentence, Greenwater is what cycles through vegetation and soil – producing all that is green (including coffee trees)! 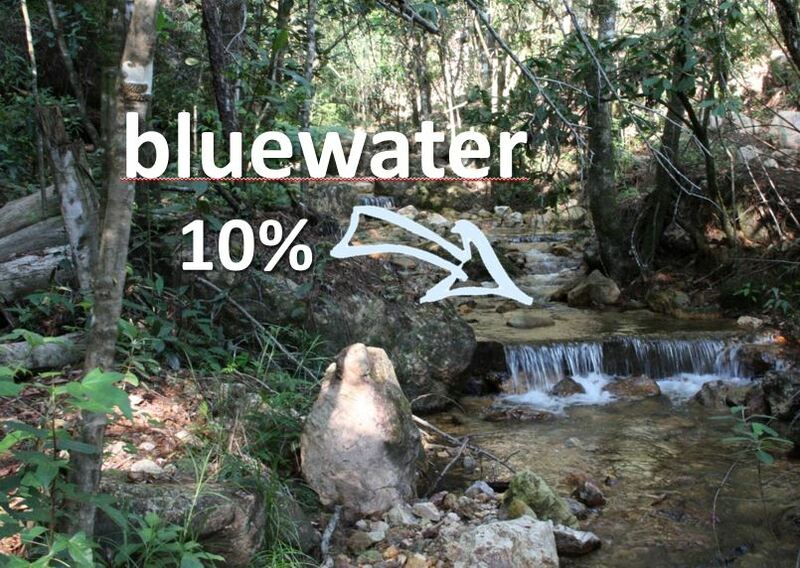 The relatively small amounts of rain not captured in the greenwater cycle, become Bluewater in various forms. Some water flows overland, forming streams and rivers. Some water infiltrates into soil, beyond the vegetative root-zone, flowing underground (downward or lateral) forming natural aquifers. Bluewater is what flows through pipes and aqueducts. Bluewater is what flows through your coffee grounds to produce your black cup of goodness. Bluewater gets a lot more attention (and investment) for obvious reasons. This is the water that we capture, divert, and pump for drinking water, irrigation, industry, and all the reasons human societies use water. We compete and fight over access and control to bluewater. Water policies and programs, public and private investments focus on managing waterblue water. Even the new policy paradigm called Integrated Water Resources Management (IWRM) focuses almost solely on bluewater management. In contrast, greenwater is virtually neglected in the policy realms. The brilliant Swedish scientists (Maren Falkenmark and Johan Rockstrom) that popularize the term, greenwater, call attention to how important it is to our natural and agricultural systems. They point out that 80% of the world’s agricultural production comes from greenwater – meaning it’s not irrigated. 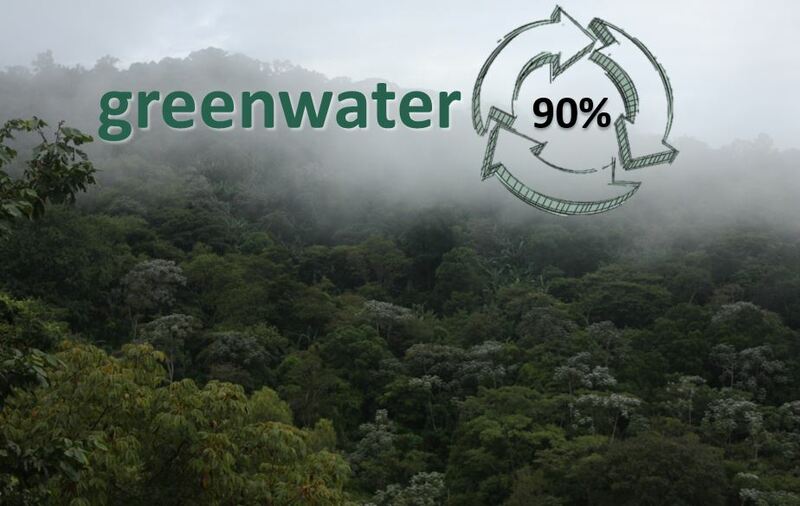 But greenwater resources are threatened by environmental degradation, climate change, and other threats. They argue that our water policy and investments need to also focus on greenwater if we are to sustainably meet global food demand for future generations. Coffee is a greenwater crop. Even the tiny fraction of coffee farms that irrigate, they are really only supplementing greenwater when conditions are extremely dry. And as we explained in an earlier post coffee agroforestry systems are one of the best agricultural systems to manage greenwater and bluewater cycles. That’s something the coffee industry should embrace! Needs a much bigger debate. I agree with excellent and thought-provoking. Not sure about “debate,” though. I prefer AUDIENCE.